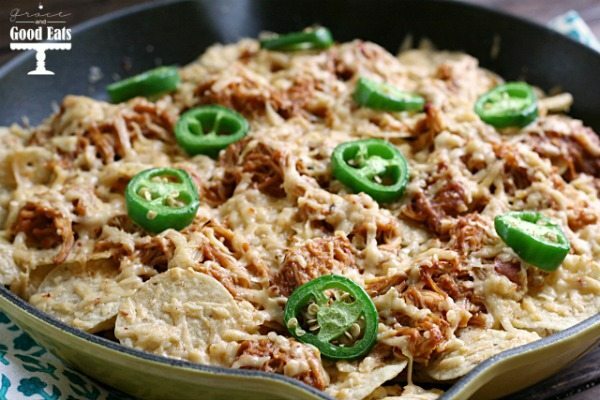 These Slow Cooker BBQ Chicken Nachos are an easy weeknight meal or appetizer for a crowd. Toss in the slow cooker and finish in a large skillet in the oven for cheesy perfection. I’ve been trying to incorporate more slow cooker meals into our weekly meal plans lately. Partly because I’ve been in a dinner rut and feel like I’m making the same things every week, and partly because the evenings can get pretty hectic around here, so I’ve been trying to free up some time. Tonight’s meal was so easy and so delicious, I knew I had to post it right away. 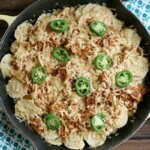 If I made these Slow Cooker BBQ Chicken Nachos week after week I don’t think anyone in my family would complain! My husband isn’t a big fan of BBQ flavors- he likes it when it makes sense (like for actual BBQ or ribs) but something like grilled BBQ chicken isn’t his favorite. He was teasing that the whole house smelled like BBQ while this was cooking (Heaven) but we were both very surprised at the end result. It’s not a -POW- BBQ flavor like you might expect, it’s a very subtle, smoky, sweet flavor. (This is the BBQ sauce I used.) My husband, my oldest, and I ate this entire skillet of chicken nachos in no time flat. I always love using my slow cooker, but I especially love it when the recipe is one you can just dump in and walk away. Toss three ingredients in there, no chopping or prepping, and cook on low for 4-6 hours. DONE! 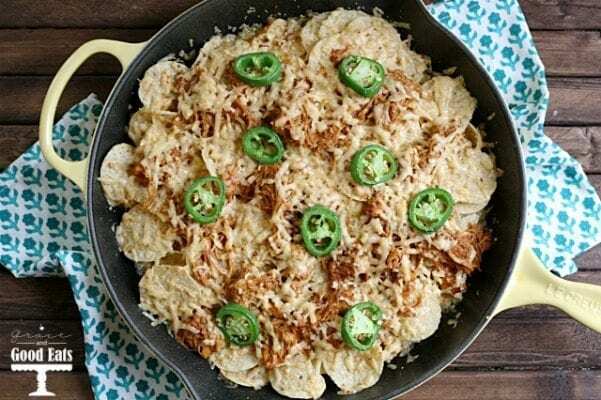 Layer your nachos in a skillet or on a baking sheet and pop in the oven just long enough for the cheese to melt into deliciousness. I wish we had some cilantro and red onion on hand tonight because that would have taken this recipe over the top. We obviously served this for dinner, but this would be a perfect appetizer for a game day party or get together. These slow cooker BBQ nachos are an easy weeknight meal or appetizer for a crowd. Place your chicken, BBQ sauce, and Chipotle sauce in the slow cooker on low for 4-6 hours. When fully cooked, shred with a fork (in the slow cooker, with all the juices). Fully cover a skillet or baking sheet lined with parchment paper with a layer of chips. Top the chips with chicken and cheese. Arrange another layer of chips, chicken, and cheese. Top with jalapeno, onion, and cilantro. Bake for 10-15 minutes, until cheese is bubbly. Oh my gosh this looks so delicious! Im pinning this so I can go back and make some for my family!